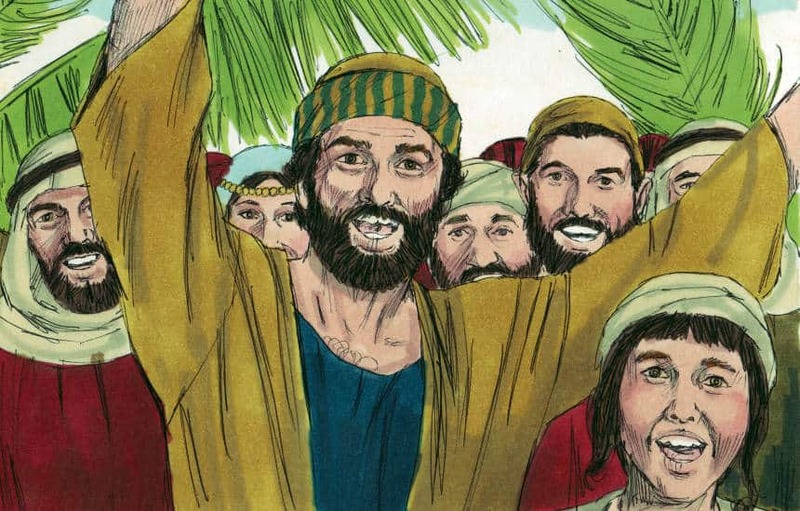 This Palm Sunday Lesson was created for a small group of children between the ages of 6-9. They will discover that the greatest need for all people is to be forgiven from their sins. Learning Goal: Students will learn that our greatest need is to be forgiven from our sin. Learning Activity #2: Introduction to Bible lesson-Needs & Wants. Have items/pictures of things we need to live and things that we want but don’t need to live. God knows all that we need and want. The most important need all people have is forgiveness of sins. We just named things that we needed to live. Food, air and water are very important to have to stay alive. However, sometimes we may have those things and die. After we die we will either live forever in heaven with God or separated from Him in a place called hell. Since none of us know when we will die, do you understand why I just said the most important need all people have is forgiveness of sins? For the next couple of weeks our lessons will allow us to turn our eyes to the Easter story. Let’s turn to Matthew 21. For 3 years, Jesus the Son of God had been teaching God’s people how to live a life that pleases God. He showed God’s power by healing many people. Before Jesus was born and Joseph had learned that Mary was pregnant and they were not yet married, an angel told Joseph to take Mary as his wife because she was going to give birth to God’s Son. Joseph was told to name God’s Son Jesus because He would save the people from their sins (Mat. 1:18-23). Jesus’ name was a reminder for the main reason He came to this earth. He came to provide for our greatest need, to be saved from our sins. We have been studying the prophets in the Old Testament for the past few months. It is exciting that today as we turn to Jesus’ final days on earth we will get to look back at how the words that the prophets spoke came true in our lesson about Jesus today. Let’s get into the story from the Bible today and as we listen to this familiar story we are going to see how God’s prophets spoke about this very story many, many years ago and it happened just as God said it would. The disciples went into the village and they found the colt and his mother tied to a post outside on the street (Mark 11:4). They went over to the donkeys and began untying them just as Jesus said. The owners of the donkeys said, “What are you doing untying them?”(Luke 19:33) The disciples said exactly what Jesus had commanded them to say. And just as Jesus said, the owner let them take the donkey and her colt to Jesus. Jesus told them what would happen and it happened just like He said. When the disciples brought the colt back to Jesus they placed some clothes on the colt’s back and Jesus sat on it. As Jesus rode this young donkey into Jerusalem and the people saw Him coming, they began to lay their clothes on the road and they cut palm branches (John 12:13) from the trees and spread them on the road. The palm leaves in these times symbolized triumph and victory. At the time that Jesus was entering Jerusalem riding a donkey, God’s people were being mistreated by the Roman government. They were shouting hosanna which means “Oh save!” When the crowds saw Jesus riding a donkey they welcomed Him as their king. God’s people felt that their greatest need was to be rescued from the Roman government and they thought Jesus was coming as the King to save them from the Roman government. God knew what they felt they needed but He knew that their greatest need was to be forgiven for their sins. When John wrote about this incident in John 2:13-17, he said in verse 17 “Then His disciples remembered that it was written, “Zeal for Your house has eaten Me up.” (Psalm 69:9) Once again something that God prophesied through His prophets many years ago was happening through the life of His Son Jesus. While Jesus was in the temple blind and lame people came to Him and He healed them. While all these things were taking place Jesus had some critics standing their watching His every move. The chief priests and scribes saw the wonderful things that Jesus did, they could hear the little children praising Jesus as they sang, “Hosanna to the Son of David!” and yet they were indignant. Indignant means to feel or express anger. They were angry at the things they saw. As we close our Bible lesson we can have great joy as the crowds did on the day Jesus rode into Jerusalem. We have God’s complete written Word so we know that a week later after this event Jesus died on the cross so our sins could be forgiven. Celebrating Easter is a reminder that Jesus came into this world to die in our place so we could have forgiveness for sins. When He shed His blood on the cross He became the perfect sacrifice for our sins. Because Jesus was sinless, His death fully satisfied God’s anger toward sin. In order to be forgiven from our sins we must repent of our sin and believe that Jesus died on the cross, was buried and rose again 3 days later. Let’s take a few moments of silence to thank Jesus for providing for our greatest need to be forgiven for our sins. Close in prayer. Fantastic lesson. Thank you! We will use it in our upcoming VBS. Please consider replacing the term Easter with Resurrection or Passion or a term not related to an ancient pagan holiday or the Easter Bunny.